(2017) “Rethinking the Work of Geographical Indications in Asia: Addressing Hidden Geographies of Gendered Labour” (with Ali Malik). In Irene Calboli and Ng-Loy Wee Loon, eds. 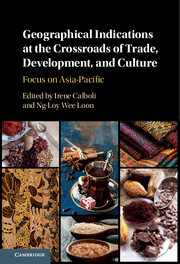 Geographic Indications at the Crossroads of Trade and Development in Asia (Cambridge University Press), pp. 87-121.